Do you have a video or movie in mind that you would like to stream during your free time? With Globe’s GoWatch 99 promo, you can use your favorite streaming app for only 99 pesos for 3 days. You are given 2.5GB of mobile data that you can use to watch videos and movies using apps like YouTube, HOOQ, Netflix, Tribe, Cartoon Network, Disney, NBA and iWantTV. 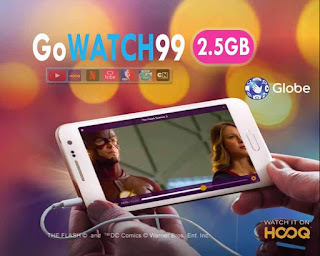 Unlike GoWatch 29 and GoWATCH399 that requires to you to subscribe with GoSURF50 or higher internet promo, the GoWATCH99 is a standalone offer that you can register if you’re not registered to GoSurf. You do have two options to subscribe to this promo. The first is via *143# USSD code menu and the second is through SMS text using the correct keyword. Note: Premium subscription on the mentioned apps is not included when you register to GoWATCH 99 promo. This offer is available to Globe Prepaid, Postpaid and TM customers nationwide. To check your remaining MB or balance just text GOWATCH 99 STATUS to 8080. For updates check out Globe GoWATCH offers.